For the next match – Portugal vs Morocco. For the next match – Iran vs Spain. Morocco take on Iran in the opening Group B game of the tournament. 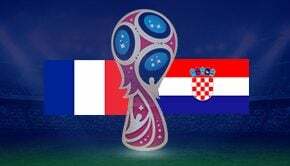 Both sides have been dealt an incredibly difficult draw alongside European behemoths Spain and Portugal and they are each considered outsiders to qualify for the knockout stages of the competition. If either of the fancied sides underperform, these two teams will be hoping to sneak through to the last 16 at their expense. This match is a great way of building some confidence ahead of two tough-looking Group B encounters and both teams will be desperate to get some points under their belt. These two sides have never previously met in a competitive fixture. Morocco have been labelled ‘dark horses’ by some pundits and the Atlas Lions do have plenty of players who regularly ply their trade in Europe. Medhi Benatia is a Serie A regular and is part of a Juventus side who wrapped up their seventh successive title in May 2018. Hakim Ziyech is a regular starter for Ajax, whilst Romain Saiss helped guide Wolves to promotion this season. Following their explosive qualifying campaign and friendly-success over Serbia, many will be expecting them to collect all three points in this fixture. Iran were one of the first teams to secure qualification for the 2018 World Cup although the level of competition they faced is questionable. They scored 26 times and conceded just three times in eight matches and could be hard to break down once again. Rubin Kazan’s Sardar Azmoun is arguably their standout star and the former Rostov-man netted seven times during qualifying. He’s been linked with a move to a number of clubs and could put himself in the shop window with a decent World Cup. Whilst Morocco will be fancied to pick up three points from their Group B opener, they could struggle to break down a stubborn Iran defense. They are built upon solid foundations and will be well-organised from kick-off. This match has a decent chance of ending all square with the points being shared between the two nations. A stalemate is priced at 21/10 with William Hill. This game was always unlikely to be a high-scoring, end-to-end affair with both sides built from a solid defensive base. Morocco kept six consecutive clean sheets towards the end of their qualifying campaign and with the aforementioned Medhi Benatia at the back, they are unlikely to make too many mistakes in defence. Under 2.5 Goals is available at 4/9 with Net Bet and although it’s a short-price, it looks highly likely to land. Under 1.5 Goals is also tempting and can be backed at 23/17. 0-0 appears to be a likely scoreline for this tight and tense opener and it’s available at 6/1 with 888Sport. The aforementioned Sardar Azmoun is one of the more creative players on the pitch and we recommend backing the Rubin Kazan star at 17/2 with 888Sportto score the first goal of the game. During the final round of qualifying, Morocco scored 11 times and didn’t concede a single goal. Head Coach Carlos Queiroz has now led three different national teams to four World Cups. Morocco: Yassine Bounou, Achraf Hakimi, Hamza Mendyl, Manuel da Costa, Medhi Benatia (captain), Romain Saïss, Hakim Ziyech, Karim El Ahmadi, Ayoub El Kaabi, Younès Belhanda, Fayçal Fajr, Munir Mohamedi, Khalid Boutaïb, Mbark Boussoufa, Youssef Aït Bennasser, Nordin Amrabat, Nabil Dirar, Amine Harit, Youssef En-Nesyri, Aziz Bouhaddouz, Sofyan Amrabat, Ahmed Reda Tagnaouti, Mehdi Carcela. Iran: Alireza Beiranvand, Mehdi Torabi, Ehsan Hajsafi, Rouzbeh Cheshmi, Milad Mohammadi, Saeid Ezatolahi, Masoud Shojaei (captain), Morteza Pouraliganji, Omid Ebrahimi, Karim Ansarifard, Vahid Amiri, Mohammad Rashid Mazaheri, Mohammad Reza Khanzadeh, Saman Ghoddos, Pejman Montazeri, Reza Ghoochannejhad, Mehdi Taremi, Alireza Jahanbakhsh, Majid Hosseini, Sardar Azmoun, Ashkan Dejagah, Amir Abedzadeh, Ramin Rezaeian.